The Southeastern Provision slaughterhouse had a septic system failure in March that caused the spread of sewage into the environment. Just weeks before the ICE raid at Southeastern Provision, the Grainger County slaughterhouse faced a crisis of another kind: a sewage system failure and spill that triggered a boil alert for residents living nearby. Tennessee Department of Environment and Conversation records obtained by 10News show Southeastern Provision LLC now is working on a temporary plan to move its waste. The plant at 1617 Helton Road near Bean Station employs, or at least employed until this week, some 100 people, records show. On Thursday morning, federal officials raided the plant, taking away dozens of workers who may lack proper immigration documentation. A search warrant also states the plant was failing to follow payroll and tax laws. The septic system failed in March, sending waste into the area and exposing nearby residents to potential contamination, according to TDEC. The state stepped in, and local residents were advised to take precautions to avoid contamination. "(TDEC) provided well sampling to the 12 households which had the potential to be impacted by surface flow of waste," TDEC spokesman Kim Schofinski said in a statement to 10News. "We worked with local emergency management agencies to ensure homes with potentially affected drinking water wells were provided bottled drinking water." The state also is assisting impacted households so they can link to public water systems and install treatment, according to Schofinski. TDEC will continue to offer its expertise and oversight assistance at Southeastern Provision, the spokeswoman said. On an emergency basis, Southeastern Provision is now hauling its sewage waste in 6,000-gallon loads in a tanker to a Greeneville site, according to records. 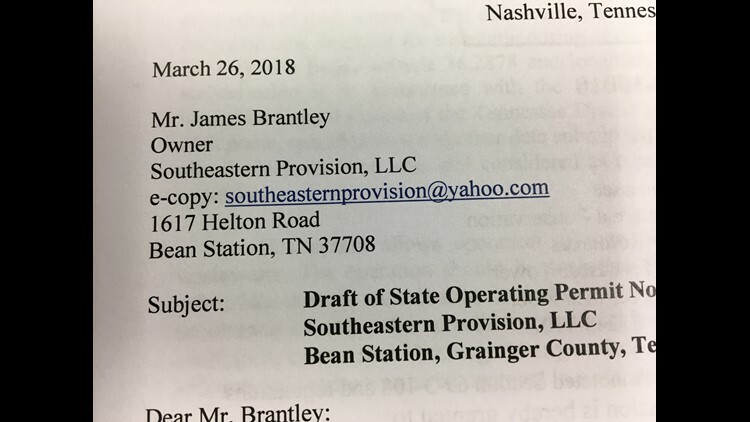 Document show a temporary pump and haul system permit was issued March 26 to plant owner James Brantley. The temporary process will include disposal through manual pumping into a tanker, records show. The permit is good for a year, documents state. Records show the plant may need to haul as much as 50,000 gallons of waste a day until a more permanent solution is installed. "The operation should be such that there is no discharge of wastewater to any surface or subsurface system, watercourse or drainage ditch because of an overflow, spills, and/or because of the occurrence of any other condition that singly or in combination with any of the aforementioned conditions causes such discharge to any surface or subsurface stream, watercourse or drainage ditch," the permit states. The plant must pump its waste on a regular schedule "to ensure that a reasonable margin of safety is provided against the possibility of an overflow." A pumping log must be maintained for review by the state and someone who represents the plant must be present "at all times" when waste is being transferred to the tanker to ensure spills don't occur.